Not a romantic comedy, instead: Nate’s thoughts on Libraries, Space, Technology, Design and everything in between. This is a long posting, but its the most important thing you are going to read on my blog. So read it, OK? Earlier this week, The New York Daily News ran a story describing how budget cuts are preventing Brooklyn Public Library from opening an innovative new service point in DUMBO, Brooklyn. I developed this new service model with BPL over the past two years; it began as a project while I was student at Pratt Institute and became my job to pursue and develop it at the library. While the project remained an active pursuit for Brooklyn Public Library, it made sense not to discuss the details of the service model, the potential locations, and the incredible impact it could have by bringing library service to communities that have been largely neglected. Now, in light of the alarming lack of funding support from the city, and in recognition of the fact that building a 21st century public library is neither a closed nor a proprietary act, I feel compelled to share the details with the greater library community in hopes that this work can be used anywhere, by anybody. With any luck, a stand-up community figure in Brooklyn will recognize the importance of this venture, and perhaps they can find it in themselves to donate the necessary funds to support these efforts and build social capital in their neighborhood. New York Public Library received a 100 million dollar donation last week. WHAT ABOUT BROOKLYN PUBLIC LIBRARY??? We are NOT the same system!!! 10 million dollars, or even 3 million dollars given to Brooklyn Public Library could open up and staff quite a few library Outposts. Each of these Outposts would have a tremendous positive impact on their immediate community; each of these Outposts would serve to strengthen Brooklyn as a whole. • Strategic location. The Outpost is a small space in a commercial area, a business improvement district, or a transportation hub. Rather than bring the patrons to the library, the Outpost brings the library to the patrons. • Extended service hours. The Outpost will be open from 8AM until 10PM, giving the community access to library materials, exhibitions, and programs during the times most convenient to them. • Collection available via online holds system. Rather than providing a localized browsing collection, the Outpost will connect users to all library materials via the catalog. • Reference service. Outpost staff will provide exceptional reference services using online databases and internet searching strategies. All reference sources will be electronic. • Wireless access and digital library content. The Outpost will be a comfortable WiFi zone to work in from a table or play in from a lounge chair. Through patrons’ portable devices they can access digital content via the library website. • Programming and Exhibition space. The Outpost will feature exhibitions that pair the library’s collection and services with art related to community interests. The space will also be flexible enough to accommodate performances, lectures, concerts, discussions, even meals during evening hours. Library Outposts are storefront library service points, no more than 1500 sq. ft. in size, centrally located in busy commercial districts or near transportation hubs. The storefront presence makes the Outpost agile and adaptable to the particular features of each community, providing fundamental library service and serving as a gateway to the full range of programs, classes, and events offered throughout the larger service ecology. The space is easily transformable; one moment a silent reading room, another moment a performance art space, another moment a forum for a community group meeting. Storefront library facilities have been attempted in the past with limited success, but the Outpost model takes advantage of emerging technologies to reconsider the distribution of library content and materials (you know, like books, DVDs, etc.) and invent itself as something entirely different. Presently a few libraries offer similar services: Houston Public Library has a few small, tech-heavy locations, Contra Costa Public Library offers material vending machines in the BART stations, and with the generous help of the Gates Foundation, New Orleans Public Library has opened some storefront facilities that have been received enthusiastically by the community. The Outpost model combines these practices and takes them to the next level. With the rise of the Internet as the primary public information transfer medium, library patrons have a new set of expectations. Just as clothing shoppers size up their potential new outfits in an online environment, just as antiques enthusiasts scour eBay for the bargains they once found at flea markets, library patrons now browse online catalogs for the materials they once hunted for on miles of shelves. For many library patrons the browsing experience has already become a virtual phenomenon rather than a physical reality. While this shift emerged slowly at first, library catalogs are quickly becoming more and more user friendly. Online reserve statistics collected across the county support the popularity of this virtual browsing trend. Between open source products like LibraryThing for Libraries, OpenLibrary.org, and the Google Books API, virtual browsing is becoming simpler, access to catalog records is getting easier, and physical collections are being exposed and utilized in more ways than ever. Libraries need to embrace and welcome this change as an opportunity to provide new, unique service delivery, and we need to adjust our physical spaces accordingly. So I’ll explain the biggest mental leap associated with the Outpost concept first, the piece that really makes it unique: the Outpost has NO LOCAL COLLECTION. Every single piece of print material (with the exception of magazines and newspapers, and those can be eliminated digitally in a different manner) is an item that was requested online for pickup at the Outpost location. This in turn frees up 1500 sq. ft. of library space for programs, exhibitions, classes, movies, concerts, community meetings, serving coffee, and virtually any community-building, social capital-creating activity. The library of the 21st Century has to maintain a physical presence, but that presence cannot always be in the form of a well-organized, publicly accessible book warehouse. Now, before any librarians freak out and scream, “NO! People still want to browse through stacks of books!” I want to make it abundantly clear that the goal is NOT to replace all traditional libraries with library Outposts. An Outpost is just one node in a network of different physical service points. Just as the car-culture era bookmobiles didn’t replace library branches, neither will Outposts. The important thing is getting these little service nodes into the community in the right places, and giving people as much as we possibly can out of them. Location is everything in the urban environment. When I began developing this idea I was using Brooklyn as a case study, I’ll continue to do so here, and I am confident my readers will see how this can be implemented in any urban public library system. It is also important to understand that urban communities are in a constant state of flux. 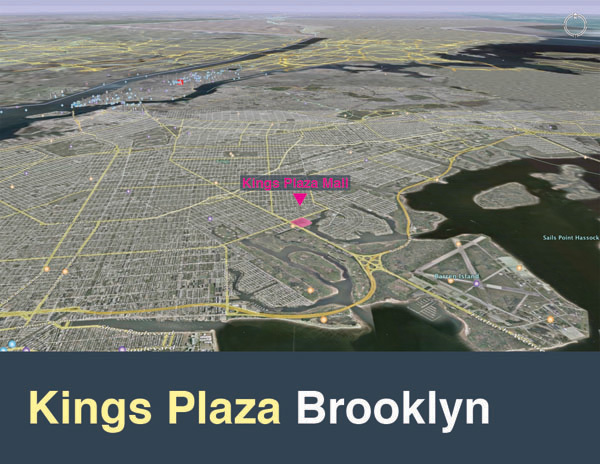 Demographics in Brooklyn change rapidly and it is difficult to provide needed services with a limited budget and aging facilities in fixed locations. This presents a challenge for the library. Many of BPL’s branches were built in the first two decades of the 20th century; since then entire communities have moved, disappeared, shifted, and grown. Library facilities have not been able to follow the people as community centers and business districts migrated to new areas. Many large, beautiful public libraries are located in desolate and remote corners of their neighborhoods. Regrettably, the working adults who live and labor in the rapidly developing communities have moved out of reach of the Brooklyn Public Library. They have become potential patrons rather than active patrons. This is unacceptable; the public library’s mission as a democratic institution supporting universal self-initiated education demands a highly visible central location. At the same time that our neighborhoods have changed physically, Brooklynites’ expectations of service hours have rapidly altered in recent years (I believe this is a safe assertion nation-wide, particularly in urban areas, as well). When banker’s hours still meant something, citizens were accustomed to waiting in line to receive necessary services. Today, we expect stamps, cash, train tickets, Metrocards, even groceries to be available whenever we want them and with minimal human interaction. 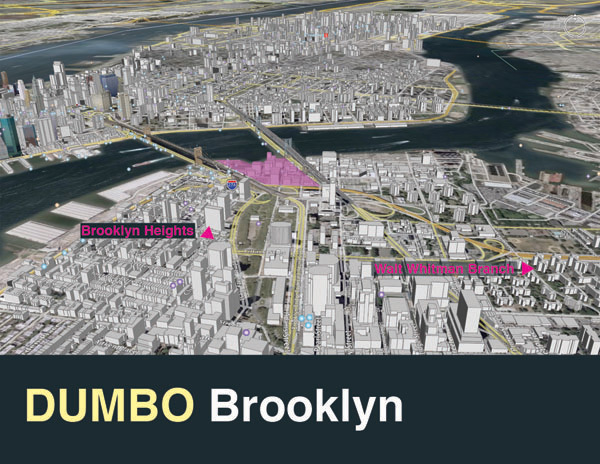 I’m going to show you a few maps of Brooklyn’s neighborhoods to use as examples of urban shift, but I’ll use DUMBO as the primary example. These communities are unique but they have each experienced dramatic demographic and physical changes in the last ten years. All lack accessible library services in their revitalized areas. It is crucial that the public library tracks these changes and serves these people, and it is crucial that the library is provided with adequate funding so that we can do so properly. DUMBO, for those not familiar with Brooklyn, is the area Down Under the Manhattan Bridge Overpass. It is a fascinating neighborhood known for its arts community, particularly architecture and design, but everything else as well. Just 10 years ago DUMBO was a drastically different place, filled with empty warehouses, industry, and many, many rats. The rats are probably still there, but there isn’t much empty space in DUMBO now after the enormous urban renewal effort that has occurred. DUMBO is literally a different place, and you know what their community lacks? A library. There is no library in DUMBO, and to hike to another library requires navigating through highway and bridge ramps and a solid 25 minutes of your time. An Outpost in DUMBO would give the community immediate access to the library’s entire collection, AND it would serve as a program and exhibition space for a specific audience. Another interesting example is the area that the real estate folks are calling “Greenwood Heights”. 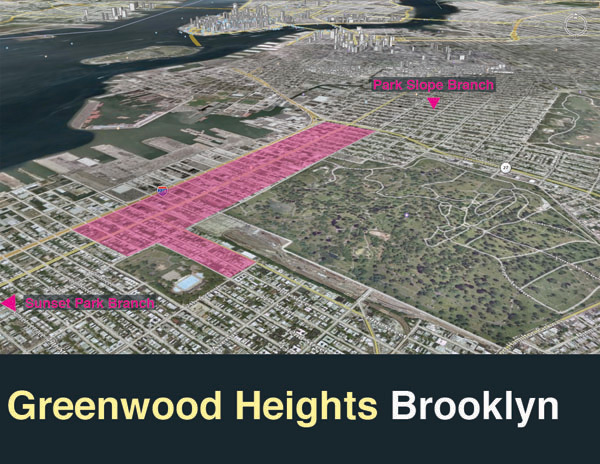 Greenwood Heights is the fastest growing Mexican community in Brooklyn. The streets are always packed, and a major express subway hub makes for quite a bit of foot (and auto) traffic. New schools are being built. The nearest libraries, as you can see on the map are farrrrr awwwway. This is another perfect opportunity to provide a new service to a new community. Perhaps the Outpost is reconsidered as a computer center in this location? I quote this figure in every other blog entry I write, but AGAIN, the Pew Internet study concluded that 2/3 of all people coming to the library come to use a computer. A Greenwood heights technology center, combined with Outpost-style material delivery could actually give users what they need. It’s a perfect exercise in user-centered design: listen to what the users want and then provide it for them. Finally, what about Kings Plaza mall? Other libraries, for example King County in Washington State, offer services in shopping malls. What if we offered an Outpost or computer center here? Again, we go to where the people are. I hope this all makes sense, if you got this point in reading you may have recognized that some of the text was cut-and-paste from the many, many iterations of this concept I’ve gone through. I really believe that this model, or similar versions of it represent one aspect of the future of public library service. I’m not even going to pretend this represents some kind of all-encompassing holistic solution to the many challenges faced by urban public libraries, but it is a start. The operating cost of one of these facilities is a fraction of the cost of operating a full-sized branch library: that alone is a solid argument for efficiency. Potential benefactors: donate to the Brooklyn Public Library, demand innovative services. The librarians have the solutions but we simply cannot afford to put these ideas into action. Brooklyn deserves the best.